Transparent Background for Blogs. ~ The Blog Doctor. You are here: Home > Transparent Background > Transparent Background for Blogs. The first step is to find or create the picture you wish to put up as the background. You can create a small picture in any graphics program. It should be small ( around 96x96 pixels would do) and 'tileable'. This means that it should repeat itself without any borders across your web page. To source such graphics from the Internet just do a Google search for 'graphic backgrounds'. After finding the picture save it to your hard disk (make sure of any copyright conditions). Then upload the picture to Photobucket or Googlepages and copy down he link of the picture. The CSS part of the template is the code which lies between <b:skin><! [CDATA[ and ]]></b:skin> tags. Replace 'URL OF PICTURE' with the link to your picture. The background-image line shows the location of the picture where you have uploaded it at Photobucket or Googlepages. The background-attachment line fixes the picture so that it does not scroll with the page. The background-repeat line tiles the picture vertically and horizontally if you give it a repeat parameter. Click Preview and then Save Template. Clear cache and view Blog. 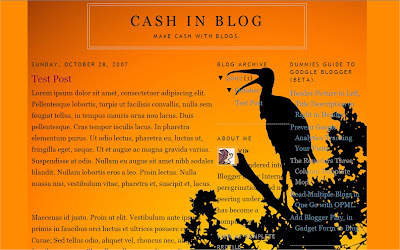 Now that your background is ready it is time to make your blog transparent. NOTE : The sections in your blog may have different names depending on the template. 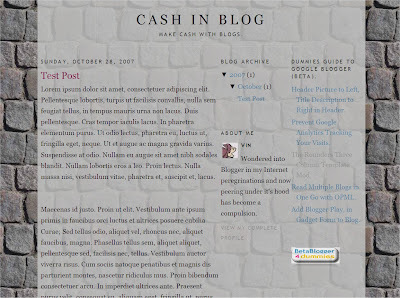 Add the code to a section and click on Preview button to see what parts of the blog become transparent. Also experiment by changing '0.85' (opacity and moz-opacity) and '85' in filter: alpha(opacity=85) to any number between 0 to 1 in the first and 1 to 100 in the second to vary the transparency or opacity. You can see the above code effect in this demo blog. 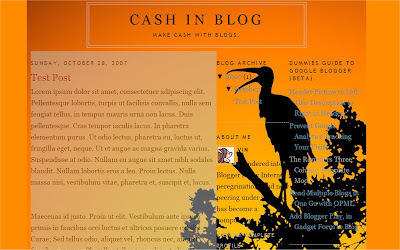 I have given a white color to the various sections and the rest of the blog looks like a transparent skin sliding over a fixed wall (background). 55 VIEWERS CLICKED HERE TO COMMENT ON THIS POST. ADD YOUR COMMENT. 1. Although I THINK I have a bog + AdSense set up in Google, I have great difficulty getting back to my blog to add more material. How do I do that? 2. Where and how do people get to my blog to read it? 4. I’m trying to add an internet clipart to my blog but also can’t get that done. I would greatly appreciate SPECIFIC WRITTEN instruction about how I need to proceed. First of all let me tell you that your blog is very helpful. I found you via the Help Center, where "panther2" mentioned this site in his answer. I did exactly what panther2 suggested, but only about two-thirds of my background sidebar colors changed! Is this some kind of an error or am I doing something wrong? Please help! I reverted to the original color now. If you send me your email address, I could invite you because it's private. I followed exactly what was mentioned. However I realize a little problem. If the method was used, all picture or images that are posted on my blog are also translucent. Do you know of any methods or ways that I can make the photos opaque? I have the same question that zat. I want to make my background transparent, without affecting letters and pictures. Someone told me that it could only be possible if I created another "div" section, and use one for the background and another for the letters. I'd be grateful if you could explain how to do that! That will not work since the other "div" will be located inside the outer wrapper and will inherit the same properties. I followed exactly what was mentioned. However I realize a little problem..I tried to change my background ( use my pic ) but cannot work. Please help me..
Go through above post again and correct the code. hi all & thanx for this great code. What version of IE are you using - 5.5, 6, 7 or 8? Vin thank you for your fast reply! i'm using IE7 and as you can see my header & my footer refuses to cooperate with that script. i do not want to place that script at the outer-wrapper (which is working fine on all page) because i want different transparencies in each segment of the page. Cross browser Compatibility is always an issue. I see which browser is being used by majority of my users and try to use the hacks for that browser only. Hey. I am a dummy, I went with the code you put in for the background image, problem is, even though the image is legal, I cannot view the image on preview. It is as if nothing happened with the code, I did it exactly the way it says. I use a minima template, what should I do? This is seriously frustrating. I only started it, can you please email me, or respond quickly? This issue is frustrating.. I don't see it in your template code! Which code did you modify? I can't help if you respond after 4 days! Also you have not told me your email address! Thank you so much for the help, I appreciate it a lot. But how can I make the pictures not transparent? So sorry, I am technologically retarded when it comes to these things. Hope you can help. :). Use the code in the first part of this post above the sub-heading : TRANSPARENT BACKGROUND FOR BLOGS. I see your background picture as fixed. Try clearing the cache. Thank you so much for your article. I have a lot of fun playing around, using your technique. Works like charm in Firefox! but not in EI. I worked around it this way: instead of using the transparency code, I covered the background picture by drawing one layer of gradient shade on top of it to give it a look of transparency (using MicroSoft Picture It! 7 program)then upload it to the web. Thanks again Vin for giving me an idea for my blog, you are great! Could you tell me how I stack multiple pictures vertically? When I try to repeat your steps for the second picture it gets rid of the first picture. Help!!! You can only put one image up using this method. Create that image in an image editor program on PC by stacking your other images into it vertically like a collage. Then use that single image for background. Apply the changes as per the instructions in the above post. Then clear cache before viewing blog. Then let me know if transparency does not appear so that the code changes can be checked out. and tell me wat u thought! I followed the instructions for the first part of the blog but when It got to the part where it says to go to mandarin designs, I don't know which code to garb to make the outer wrapper transparent. help. "This is the code to apply :"
thanks. but what i was really trying to do was have one picture for the background of my blog and one picture for the blog posts. How would i go about doing that?? Have a look at : Different backgrounds in each post. I have the same problem as another one had. You see I only want my outer wrapper to be transparent but when I apply this code the content wrapper and all the photos also become transparent. Is there any way to work this out? Thank you very much for an answer and thanks for this article! thanks vin! i have more nice simple blog now. I've followed your instructions for making a background image for my blog and it still didn't work...Any suggestions? my blog's address is http://www.92blue.blogspot.com. I'd really like to know if there is a way to fix the images being transparent, if not that's cool, but I'd just like to know if there is. It is not clear what you mean by 'fix the images'. Please explain in detail with example links if possible. Thank you so much!!! Now my blog finally has a background that I actually like!! Vin, thanks for the info...great site! all my post, my sidebar and everything became gone...! First create a test blog. Publish one or two dummy posts. Then load same template as your Main Blog. Thirdly give temporary border to your 'wrapper' div so you can see what area it covers. Then apply transparency hack code as shown in above post. Once you are satisfied with the result you can use same code in Main Blog. Now I tried this opacity code, fiddled with it here and there but my problem stays the same. As soon as I lower the value from 85 to 60 for example (to get more transparency and a true "vellum" effet, the transparency is not only applied on the background of my outer-wrapper but also on EVERYTHING it contains (texts, pictures, logos, icons, etc.) making the whole center wrap barely readable. Is there a way to apply the code differently, add to it or change something else in the body of my HTML to make the transparency code work ONLY on the background of the outer-wrapper and NOT on its content??? I have the same problem as Vibi. If there is a solution, I'd be very grateful to know what it is. You seem to have figured out how to make dark, black, legible text and clear photos in the post box in your demo blog, the one with the bricks. I seriously can't get the background image to show up at all by following both the instruction, then reading nh92's comment and the second process..but either way it didn't work. I just wanted to pass out a quick thanks. I had been fidgetting with code for 3 hours now to change the background of only my blog posts and that area surrounding it, but could only find how to change the entire background. Your post put me over the top, I only had to put a color in the outer wrapper area and boom, magic! And I even customised it with the opacity code, it looks wonderful now (not in IE, but minor setback).